Who uses NASA Earth science data? Dr. Brian Mapes, to study large-scale weather and climate processes. 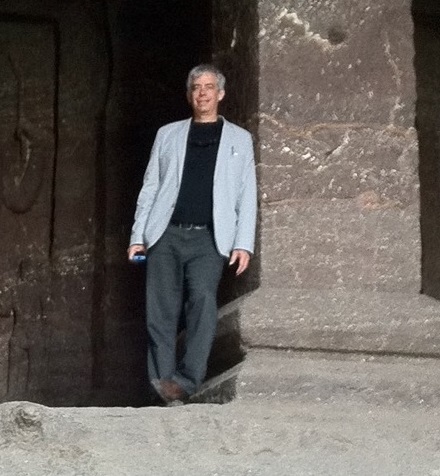 Dr. Brian Mapes at the Ellora Caves in Maharashtra, India, which is about 300 km (190 miles) east-northeast of Mumbai in western India. The Asian Monsoon plays a key role in the economy and livelihood of India and is one of the atmospheric processes studied by Dr. Mapes. Image courtesy of Dr. Mapes. Research interests: Role of vertical convection in the form of cumulus clouds and storms in large-scale (regional and global) weather and climate. Research highlights: To Dr. Brian Mapes, the study of water vapor is more interesting than many people appreciate. In fact, water vapor is one of the most important determinants of Earth’s weather and climate. Along with transporting tremendous amounts of water around the globe, water vapor’s ability to store, release, and redistribute heat helps keep Earth habitable. As water vapor rises, cools, and condenses, the result can be convective storms. The role of atmospheric convection and the impact of these convective storms on weather and climate across large regions (such as India and the subtropics) are a focus of Dr. Mapes’ research. But not all large-scale convective systems are equal. As Dr. Mapes notes, the “big gorilla” is the Asian Monsoon. If you look at the plots of Global Monthly Rainfall Averages from 1998 to 2010 created from data collected by the joint NASA/Japan Aerospace Exploration Agency Tropical Rainfall Measuring Mission (TRMM) - operational from 1997 to 2015, it’s hard to miss the band of higher than average rainfall stretching roughly across the equator. This belt of precipitation is the intertropical convergence zone (ITCZ), and is an area where Northern and Southern Hemisphere air masses converge and are forced to rise, resulting in higher than average precipitation. During the Northern Hemisphere summer, warmer temperatures and the resulting uneven heating of land and water force the ITCZ to move from the equator to stretch across Asia; during the Northern Hemisphere winter, the ITCZ is depressed back across the equator as cold, dense air settles into central Russia and creates an immense area of high pressure called the Siberian High. This seasonal, predictable change in subtropical wind direction—from cool, dry air from middle latitudes in winter to warm, moist air from tropical latitudes in summer—defines the word monsoon. As warm, moisture-laden tropical air masses rise in the subtropics during summer, the result is convective storms capable of producing significant amounts of precipitation. The Asian Monsoon affects the lives of roughly a third of the world’s population, and is one of the planet’s most significant large-scale convective systems. The Asian Monsoon sometimes is also referred to as the Asian-Australian Monsoon system, since the January rains of the Australian Monsoon are a similar counterpart to the July rains over Asia. In a recent study, Dr. Mapes looked at how a regional monsoon can have a global impact. Dr. Mapes and his co-researcher, Dr. Patrick Kelly, examined the relationship between dry conditions in southeastern Brazil and the Australian Monsoon. Specifically, they looked at the role of atmospheric heating associated with rainfall during the Australian Monsoon (which brings heavy precipitation to Northern Australia from December to March) to reduced rainfall in southeastern Brazil during the month of February. This study is similar to their 2013 work linking Asian Monsoon wet years to reductions in rainfall in the Caribbean, and both studies used the Community Atmosphere Model (CAM) developed at the U.S. National Center for Atmospheric Research. Dr. Mapes and Dr. Kelly used the CAM to run experimental global climate simulations with enhanced Asian-Australian monsoons. Enhancements to these climate simulations were created by artificially darkening the soil cover over India to absorb more sunlight (which adds heat) and by adding heat in the troposphere (the lowest level of Earth’s atmosphere) near Australia to the CAM temperature equation. In both studies, this artificially enhanced monsoon heating in the Eastern Hemisphere contributed to a westward displacement of the overall weather pattern in the western Atlantic in the resulting model output. CAM data indicate that this, in turn, led to reduced rainfall in the Caribbean (in July) or southeastern Brazil (in February). As shown in this research, although convective clouds are local, their large-scale envelope (the monsoon) can affect regional rainfall on the other side of the globe. Dr. Mapes also recently completed a near-global survey of heavy precipitation events. Using the TRMM 3B42 precipitation product, he assembled data for the greatest 1- and 3-day precipitation accumulations from 1998 and 2007 occurring between 50˚ north and south latitude. As Dr. Mapes observes, this study highlights the importance of convective and mesoscale processes in extreme precipitation events on these short time scales. In meteorology, a mesoscale process is one that takes place at a scale larger than a storm-scale cumulus convective event, like an isolated storm, and can range in horizontal extent from roughly 5 km to several hundred km. Mesoscale events include thunderstorm complexes, sea breezes, lake effect snow, fronts, and squall lines. Dr. Mapes created an interactive web atlas where users can examine an archive of record precipitation events, including links to satellite imagery and event case studies. Examination of some cases reveals that while tropical cyclones (such as hurricanes) are responsible for record precipitation in many of the locations studied, the drawing out of tropical water vapor by systems just outside the tropics (called extratropical) can also lead to heavy precipitation events, for instance in the Caribbean in late spring. Sometimes these water vapor filaments can be very long, and are called atmospheric rivers. Atmospheric rivers transport tremendous amounts of water vapor and are capable of producing intense precipitation. Along with TRMM data, Dr. Mapes also relies on global climate reanalysis data created by the Goddard Earth Observing System Model, Version 5 (GEOS-5) team. GEOS-5 is a system of integrated models combining several data sources into a single best estimate (or reanalysis) of the state of the atmosphere. Specific data used by Dr. Mapes from this reanalysis are the Modern-Era Retrospective analysis for Research and Applications and Modern-Era Retrospective analysis for Research and Applications, Version 2 (MERRA-2) products, which are historical climate analyses dating back to 1979 for a broad range of weather and climate time scales. The GEOS-5 model also can be configured to run freely without specific observation data. This creates detailed, self-consistent simulations of credible weather that never actually occurred, such as the high-resolution GEOS-5 Nature Run (G5NR). Dr. Mapes explores these data simulations to see how atmospheric processes fit together in rare events that have not been observed, but obey the laws of physics encoded in the model. Allen, T.L. & Mapes, B.E. (2017). “The late spring Caribbean rain-belt: climatology and dynamics.” International Journal of Climatology, 37(8) [http://doi.org/10.1002/joc.5136]. An animation of this research is available at youtube.com/watch?v=VTcLXfaYeGY. Kelly, P. & Mapes, B.E. (2016). “February drying in southeast Brazil and the Australian monsoon: Global mechanism for a regional rainfall feature.” Journal of Climate, 29(20): 7529–7546 [http://doi.org/10.1175/JCLI-D-15-0838.1]. Kelly, P. & Mapes, B.E. (2013). "Asian monsoon forcing of subtropical easterlies in the Community Atmosphere Model: Summer climate implications for the Western Atlantic." Journal of Climate, 26(9): 2741-2755 [http://doi.org/10.1175/JCLI-D-12-00339.1]. Mapes, B.E. (2011). “Heaviest precipitation events, 1998-2007: A near-global survey.” Chapter 2 in World Scientific Series on Asia-Pacific Weather and Climate, Vol. 5: The Global Monsoon System: Research and Forecast, 2nd Edition, pp. 15–22 [http://doi.org/10.1142/9789814343411_0002].